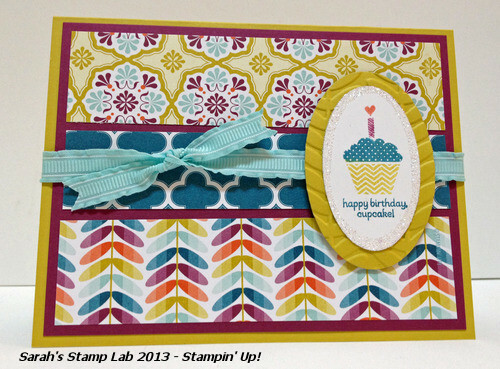 Sarah's Stamp Lab: Happy Birthday, Cupcake! I have today off from work and the whole house to myself. Can you believe it??? I plan on being in my stamp room for a good chunk of the day getting samples ready for the open house on Jan. 27th! This is a FREE event with a fun Make and Take featuring some of the new products you will find in the Sale-A-Bration flyer! Today's card is one that I am making for a Shoe Box Swap at my next meeting with my upline. It will be my first meeting, so I am really hoping that they all love this card! What do you think? I cannot get over the new Sycamore Street Designer Series Paper. I think this is my favorite DSP so far. I love, love, love the color combos. Don't forget to email me if you are interested in coming to my open house on the 27th! Also check out the Promotions, Best of 25 Years, and My Paper Pumpkin tabs above for some amazing offers!!! This is such a pretty card! Love the design. Great card! I love all the patterns & fun colors! I'm visiting from Sew Many Ways, have a wonderful weekend! Thanks, Candice! You have a wonderful weekend as well!